Chris Lovegrove, an MClinRes student, has been awarded a prestigious grant for his work into Parkinson’s patients’ experiences of anxiety. A clinical research student at the University of Plymouth has been awarded a prestigious grant for his work around the mental health of Parkinson’s patients. 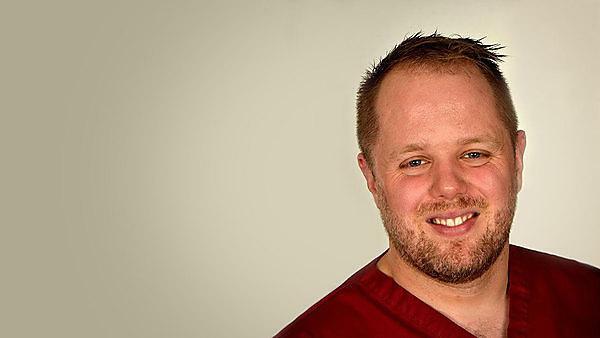 Chris Lovegrove, who is doing a masters in Clinical Research (MClinRes) funded by the National Institute for Health Research (NIHR), has received the Marion BM Lindsay Bequest and the Miss Janet Reid Trust Research Grant from the Royal College of Physicians in Edinburgh. The award is given for research into links between mental and physical health, and the £2,500 received will help Chris – who is also Clinical Lead Occupational Therapist at Royal Devon and Exeter Hospital – support the additional costs of his research into Parkinson’s patients’ lived experiences of anxiety. Chris said that currently, very little research exists on Parkinson’s effects on mental health, but hoped that his work would start to shed some light on it. “People often associate Parkinson’s with its physical effects,” he said. “But there’s little clinical research available on the condition’s impact on patients’ mental health experience. The research I’ll be doing will start to create some questions on what patients are feeling, rather than answering anything at this stage, but it’s an important piece of work that I hope will help to shape our future treatment and consideration of Parkinson’s patients." The MClinRes aims to provide clinicians with the skills to develop, undertake, manage, disseminate and implement research findings. It is intended to be the first step to developing you as a clinical academic leader within the NHS. We will support you to publish your research findings and develop you as a researcher beyond the programme. The delivery structure of the programme is intended to be compatible with your busy life as a postgraduate student, and enhance the learning process by giving you time for reflection between study blocks. You’ll develop your skills in reflection, analysis and critical debate, as well as increasing your knowledge base to the cutting edge of your subject.